If you’ve noticed that one of your appliances doesn’t seem to be operating as well as it used to, you might consider testing the electric outlet. Testing the voltage of the outlet can help diagnose any number of electrical problems such as light switches not working, dim lights, tripped circuit breakers, and electric shocks among others. Playing with electricity, however, can be dangerous if not done properly. 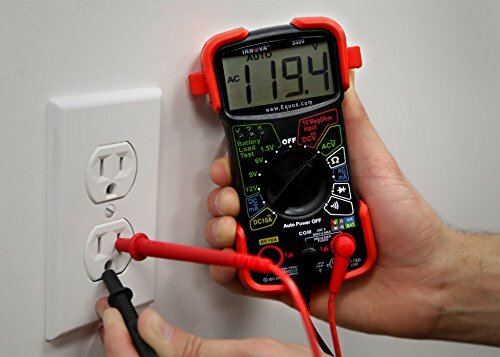 Using a multimeter to test an outlet is a safe and easy way to ensure your outlets work correctly or if you should investigate more. Please note: these steps assume you’re using a digital multimeter, not an analog one. 1) Ensure your safety before anything else. Try holding both meter probes in one hand to prevent a shock from going through your body. Also, never touch the metal probes to each other – a dangerous current could result. 2) Grab your multimeter and set it to measure voltage (AC) or VAC. According to Circuit Specialists, you should note the maximum voltage for each setting. The average household runs at 120V. 3) Connect the probes to the appropriate inputs. The black probe, also known as a banana plug, should connect to the COM input, and the red probe should connect to volts (it might also have a plus sign or a horseshoe symbol (the Greek letter Omega)). 4) Using the hand holding the probes, insert them into your outlet. The red lead should go into the smaller, narrower slot, and the black lead should go into the wider slot. This will form an electrical connection. Your voltage should measure between 110 and 120V – these is the average range for households. 5) Next, determine if your outlet is properly grounded. Insert the black probe into the U-shaped ground hole in the outlet. The shown number should match your previous reading. If these don’t match, it’s possible the outlet is improperly grounded, or the wiring is reversed. If there’s a minus symbol on your display next to the voltage, that means the outlet has a reversed polarity. 6) To test if an outlet is improperly grounded, insert the red probe into the left-hand slot and insert the black probe into the round hole. If no reading is displayed, your outlet is not grounded. 7) If you have noticed anything off about your outlets, then you now have the information need to investigate further. Multimeters come in two forms: analog and digital. Analog multimeters are inexpensive and rely on a needle that moves over a graduated scale to display readings. They can, however, be difficult for some people to read accurately. Additionally, when used as a voltmeter, they may not be as accurate as their digital counterparts. Some features of analog multimeters include overload protection, battery-operated, range switch, battery test, and a mirrored scale. A fluke digital multimeter is primarily used for calibrating volts, currents, and other electrical units. That is, it can help you measure the resistance and voltage usage of different electrical devices in your home. Many fluke multimeters can even perform other measurements such as duty cycle, shock, drop, humidity, and temperature. Almost anyone, whether you’re an electrician or a hobbyist, can use a fluke multimeter to measure electrical components. They’re great for beginners! A clamp digital multimeter is a more advanced tool than a fluke multimeter. This type of multimeter comprises different built-in tools to measure electrical flow in batteries, HVAC systems, or even machines. You might have guessed it, but a clamp digital multimeter uses a clamp to grasp the component you’d like to measure. They perform readings of measurements such as the flow of electricity, voltage, power consumption, wattage, and amps. 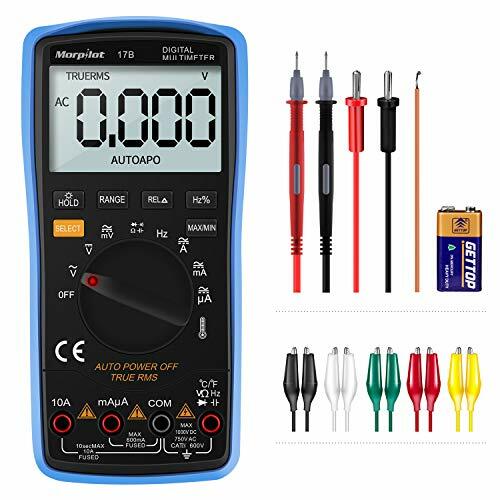 An auto-ranging digital multimeter is the simplest multimeter to use and is recommended for beginners, at-home electricians, or DIY enthusiasts. They automatically measure the readings you’re trying to find. You do not need to mess with a wide range of settings – the device does most of the work for you! How Do You Connect a Multimeter? Your multimeter should come with a few parts: the meter, a black lead with a probe, and a red lead with a probe. 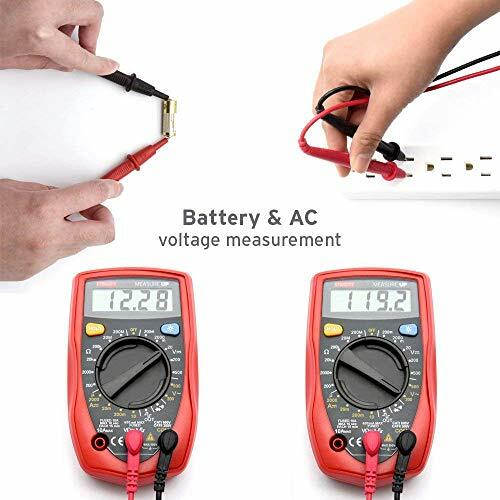 It’s quite simple to connect a multimeter. First, connect the leads into the correct ports on the meter. In most multimeters, the black lead should go into the port marked COM, and the red lead should go into the port with the omega (horseshoe-shaped) symbol. The connections should remain tight and consistent. When you’re ready to use the multimeter, touch the probes to or insert them into the device, outlet, or item that needs testing. A needle will move toward the reading in an analog multimeter. In a digital meter, the reading will show on the LCD screen. From there, you can compare the readings to standard conditions and determine if things look as they should or if there could exist underlying issues. What Do Counts Mean on Multimeter? Counts on a multimeter represent ranges that, according to BK Precision, “are used to obtain different values in measured readings.” If, for example, a meter has a count of 2000, it won’t be able to display a reading of more than 1999 (i.e., 2001). Instead, it adjusts the range and removes a digit of resolution. Therefore, a reading of 2001 would display as 20.01 V.
Is a Multimeter the Same as an Ohmmeter? A multimeter is not exactly the same as an ohmmeter. The multimeter comprises three different tools: an ohmmeter, a voltmeter, and an ammeter. A multimeter is also known as a volt-ohmmeter. Multimeters combine the functions of three tools: an ammeter, which measures current; an ohmmeter, which measures resistance; and a voltmeter, which measures the voltage between two points. Some multimeters offer more functions, but these are the three you’ll commonly find between most multimeters. These tools even measure current and voltage in both AC (alternating current) and DC (direct current) modes. Why Should You Use a Multimeter? A multimeter is extremely useful if you’re trying to determine if the wiring in your house works fine or needs attention. They’re great for almost any type of electrical project in your home or to identify if one of your appliances isn’t working as it should. For instance, you might encounter dimmed lights, increased energy or utility bills, shock, or other household electrical issues. Using a multimeter can help root out the cause of the problem and determine if the wiring isn’t grounded or if other issues have arisen. Multimeters also provide readings of temperature, duty cycles, resistance, and decibels among others. Having a multimeter in your toolkit is invaluable, especially if you are a DIY hobbyist, an electrician, in construction, or involve yourself in numerous projects around your house. One thing you should keep in mind, however, is that safety always comes first when using a multimeter. Since you’re working with live wires, there’s an increased chance that you can burn, shock, or electrocute yourself if you’re not careful. As mentioned above, make sure that you’re holding the probes in one hand to reduce the chance of creating a full circuit that could cause you harm. Also, inspect your multimeter and its components prior to any use. If you notice loose connections, physical damage, or other concerns, you’re best to not use the multimeter. Either consider borrowing one or purchasing a new one. Or, check with the manufacturer to see if they have any suggestions prior to using the multimeter. Multimeters are a highly versatile and useful tool for anyone to have, especially electricians or those who engage in electrical work of any type. They perform readings of at least three types of measurements: voltage, amperage, and current. They also come in two types: analog and digital (fluke, clamp, and auto-ranging). Using a multimeter to test an outlet is not that difficult. Once you’ve set up your device by connecting the black and read leads to their respective sockets, all you need to do is insert them into the necessary openings in the outlet. From there, if you see a reading of between 110 and 120V, your outlet is probably in good shape. If not, then you know you or a professional might need to take a closer look. Multimeters serve as an excellent tool for proactively identifying problems before they turn larger or if you simply want to test the lifespan of a battery. Overall, you can’t go wrong with having a multimeter in your toolbox! I hope you found our How to use a multimeter to test an outlet article useful. Do you have any other questions about any other multimeter?